Provincial governments should make their own decisions about putting a price on carbon pollution and not wait for the federal government to act, says a new report by Canada's Ecofiscal Commission. The report says putting a price on carbon emissions is the most practical way to reduce greenhouse gas emissions linked to climate change and Canada can't afford to dither about which level of government is going to take the lead. "Canadians are bearing the costs across the country," said Chris Ragan, chair of the Ecofiscal Commission, in an interview with CBC News. "The sooner we get policies in place that change corporate and household behaviour and start to drive those emission reductions, the better off we'll be." The commission members include a wide range of economists, former political leaders, academics and business people from all political stripes. Its mandate is to take a non-political approach to big policy issues in Canada. Its newest report, The Way Forward, points out that some provincial governments are already taking steps to reduce carbon pollution. "We actually think there are real advantages to taking these actions provincially, and part of the evidence for that is that provinces are already acting," said Ragan. For example, B.C. has had a carbon tax since 2008, and Alberta prices carbon and makes big companies cut emissions and pay into a technology fund if they don't. Quebec has linked its cap-and-trade system with California's, and Ontario is expected to announce its carbon plan soon. The report says action by the provinces will work the best. "Let them design the systems to their own provincial realities, and let them recycle the revenues in the way that is best for their local economies." The report concludes that putting a price on carbon emissions could help the economy, because revenues earned from taxing pollution could be directed back into provincial economies. "The biggest gains to the provinces come from introducing the carbon-pricing system now and actually using those revenues in a sensible way," added Ragan. Carbon pricing is a controversial political issue that could pop up during the upcoming federal election. The federal Conservative government has resisted putting a price on carbon, saying it will result in "a tax on everything." Instead, it's bringing in regulations to control emissions sector by sector. That approach has drawn criticism, because, after years of promises, Ottawa has yet to impose rules on the industry that produces the most greenhouse gases — the oil and gas sector. 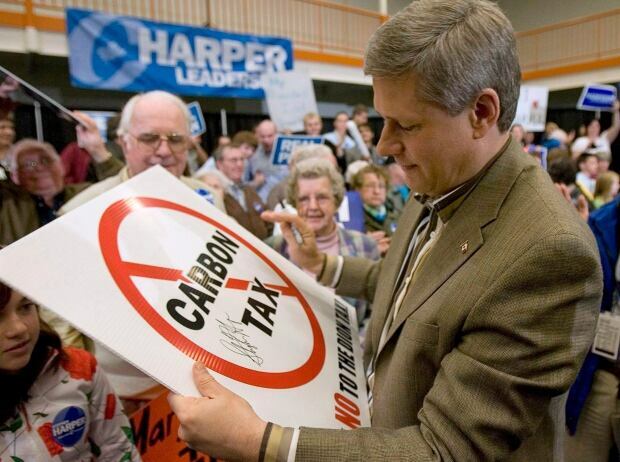 Last December, Prime Minister Stephen Harper told the House of Commons that introducing carbon pricing would be "crazy" under the current instability caused by dropping oil prices. However, in a year-end interview with CBC's Peter Mansbridge, Harper pointed to Alberta's carbon-pricing system as a model that could be implemented on a "broader" scale. The Opposition NDP has been pushing for a national cap-and-trade system. Liberal Leader Justin Trudeau recently waded into the issue during a speech in Calgary suggesting the medicare approach to carbon pricing — allowing provinces to design their own systems with the federal government setting national targets. The medicare approach is familiar to Canadians said Ragan, although he insisted the commission is not siding with any party. "Not everything that is national needs to be federal," he said. "Canada has a long history of provincial action, and many of the things we think of being most important in our day-to-day life are, in fact, done by the provinces." The report recommends that provinces increase their prices on carbon over time. The commission says the pricing should be tough enough to provide incentives to cut emissions, and the price should apply to the largest number of polluters possible. It also recommends that provinces should co-ordinate their carbon prices down the road to reduce the effects of having a patchwork across the country, but concludes that's not essential in the short term. The bottom line advice for the federal government during this process is what Chris Ragan calls "the three-S approach." "S No. 1 is: seriously study the issue. S No. 2 is: support the provinces. And S No. 3 is: stay out of it."